I play a mixture of jazz standards, samba and bossa nova, and songs of old Hawaii. The mellow sound of the ukulele creates the perfect ambience for parties, restaurants, and tropical-themed events. 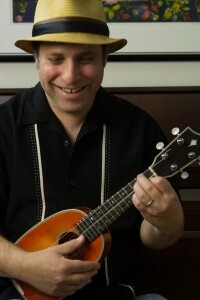 I play a beautiful pineapple-shaped ukulele that I bought on the island of Kauai. I even sing a few! Book a Solo Ukulele Show!